Studio available at theLOOM, Philadelphia’s largest collection of makers, artisans, entrepreneurs, innovators, designers, and creatives in the city. In order to provide an optimal work experience for our tenants, our spaces are not to be used for band rehearsal studios. However, professional music recording studios are welcome but proper sound proofing is required. We offer the best price per foot in the city and our full time maintenance and office staff is on site. 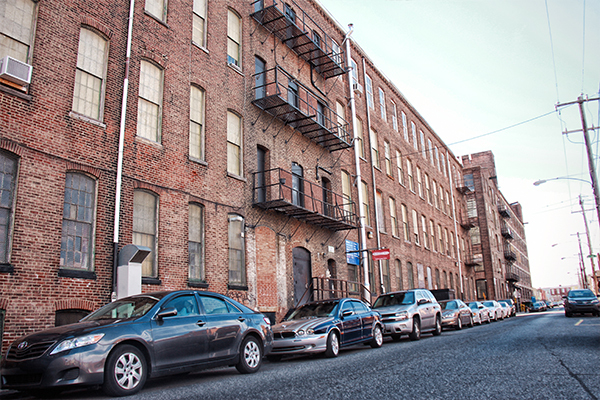 Spaces are perfect for artists studio, commercial business or offices with convenient access to loading docks, freight and passenger elevators, proximity to i95, public transit, and secured parking. Community green space, community kitchen, private security, security cameras, Copy center, UPS/FEDEX drop off and pick up, group meeting and conference rooms, and shared gallery space are all included in rent. Co-working and desk space is also available. Building is the former home of the Masland carpet mills and is a beautiful example of our industrial heritage, 10′ divided light windows on all sides provide warm light all times of day, maple floors and large wooden beams(not concrete) give a natural warmth to the spaces. Come see some space and become a part of Philadelphia’s largest community of innovators.